Remember what you were told as a child— all work and no play make Jack a dull boy? What if you could play at work by working at play? No, this isn’t a tongue-twister or an oxymoron. You can actually earn pots of money by playing games, mimicking or even by doodling. These fantastical-sounding jobs have cropped up in the past decade thanks to the growing entertainment sector that has turned the art of recreation into a money-spinning profession. While movies and TV have existed for a long time, it is only in the past 10 years or so that the entertainment industry has evolved rapidly. In the process it has given birth to new career avenues beyond the usual acting, directing and singing. The biggest revolution has taken place in the area of animation and visual effects, and gaming. Most analysts consider that both the segments are still in a nascent stage compared with their western peers, so there’s a huge potential for jobs. According to a study, India Entertainment Sector, released by Assocham in May 2009, the size of the entertainment industry is estimated to be worth more than Rs 12,530 crore, with about Rs 3,450 crore likely to be invested in the next three-four years. The sector is growing at a phenomenal rate of 39%, with the animation and gaming segments likely to see the highest jumps. According to the Nasscom Animation and Gaming Report 2008, the total revenues of the animation industry for 2008 were $495 million, and for the gaming industry, $166 million. The report forecasts that both the segments will grow to $1 billion and $830 million, respectively, by 2012. The fastest growth is expected in the mobile gaming market, which is predicted to increase its share in the gaming industry from 26% in 2008 to 35% in 2012. “About 16,000 professionals were employed by the Indian animation industry in 2006. This figure is expected to exceed 26,000 by 2010. The influence of animation is now expanding to areas like defence, bio-technology, education, etc. These areas will generate additional job opportunities,” says P. Jayakumar, CEO, Toonz Animation India. The emergence of tangential jobs from the current ones is an additional benefit. Take Avdhessh Arya, who started his career as a radio jockey and now freelances as a voice-over artist as well. As a child, Arya could never have imagined that his fondness for imitation would land him plum projects, such as dubbing for the McDonald’s and Vodafone advertisements, as well as for the National Geographic Channel and Hungama TV. A project earns him Rs 3,000-8,000 depending on the recording time, which can range from 30 minutes for an ad or audio book to three hours for a documentary. The biggest advantage of joining this industry is that you can enter even if you are fresh out of school as long as you have the aptitude. However, this ease of entry can also be the biggest stumbling block as most jobs are talent-based. For instance, to be an animator you should be able to draw well, understand anatomy and have sharp observation skills. 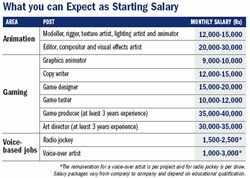 The growing popularity of the sector has prompted many institutes to offer courses geared specifically towards animation, visual effects and gaming (see table). The length of the courses varies from one month to three years. “Shortterm courses are fine for existing employees who want to hone their skills or experiment in a new area. But if you are serious about a career in this field, go for a longer course of at least a year’s duration. This will help you decide the area of specialisation and move between departments when you land a job,” says A.B.R.P. Reddy, head, CG Mantra and adviser to the Nasscom Animation & Gaming Forum. Many entrepreneurs are cashing in on the increasing demand by entertainment gourmets, who seem to have an endless appetite. “We produce at least one online game every week,” says Alok Kejriwal, cofounder and CEO, Games2win. Kejriwal was among the first entrepreneurs to have spotted the opportunity in the gaming industry. He started his career working in his father’s socks factory, but after nine years decided the job wasn’t fun. “I wanted to do something creative, so in 1998, I decided to set up Contests2win, an adver-gaming company to organise publicity contests for brands,” he says. He invested Rs 5,000 to buy a domain name and borrowed a laptop from a friend. “The laptop didn’t work but it made a good impression,” he grins. Then started the back-breaking work. “I used to call about 200 people a day, of which only five-six people would be willing to speak to me. After about five days of such exhausting work, I would manage to finagle one meeting,” he says. Kejriwal then started Mobile2win and Media2win. In 2007, he realised the potential of free online games, which led him to set up Games2win, a free online gaming company. His next project is to work on mobile gaming, especially for the iPhone and Android platforms. Providing entertainment is not the only field that has spurred entrepreneurs. Some are minting money by making fun more accessible. While on a vacation in Bengaluru from the US, where they were working, siblings Neetu and Akash Bhatia found it difficult to book movie tickets. The duo were familiar with online ticket booking in the US and decided to start the concept here. Kyazoonga, India’s first movie, entertainment and sports ticketing company, was set up in 2006. “The novelty of the concept made theatre owners wary of partnering with us, especially as few people had access to the Internet,” says Neetu. But the Bhatias believed in the concept and their dedication paid off when in 2007 they sold 4 billion movie tickets. They soon expanded to include plays, rock concerts and sporting events. However, while selling tickets for the IPL Twenty20 in 2008, they realised the need to have more retail areas to be easily accessible. Their solution: to tie up with Bharat Petroleum outlets. The next step for the Bhatias is to provide end-to-end ticketing solutions for the Commonwealth Games 2010. Joining an industry that not only zooms up in boom times but is also going great guns during a slump in other industries can only lead to a win-win situation.